ESPN is headed to the far east for an upcoming Major League Baseball broadcast. The network will carry coverage of the 2019 Japan Opening Series on March 20 and 21. The series is a pair of pre-season MLB games, which will be played live at the Tokyo Dome in Tokyo, Japan. The Seattle Mariners and Oakland Athletics will face off in the matchups. Dave Fleming and Eduardo Perez will provide commentary for the games, both of which will air at 5:30 a.m. on the ESPN app. ESPN is adding another big name to its on-air roster. The network announced on Tuesday, that it has reached a deal with former New York Yankee star CC Sabathia to serve as a contributor for its Major League Baseball broadcasts. Sabathia, a a Cy Young Award-winning pitcher recently announced that he will retire after this season. While his retirement is still months away, the new deal will see Sabathia contributing to ESPN’s MLB broadcasts throughout this season on programs, such as SportsCenter, Baseball Tonight and Golic & Wingo. Sabathia said in a recent interview, that he is focused as he moves into his final season. ESPN Vice President of Production Dave Roberts said having Sabathia as part of its talent roster is a boon for ESPN. Sabathia started his MLB career in 2001 with the Cleveland Indians, before eventually joining the Yankees in 2009. He led the league twice in wins over the course of his career, and won the World Series in his debut season with New York. Winter is officially here again, and for fans of the National Football League, National Basketball Association and National Hockey League, it’s the most wonderful time of the year. For others though – baseball fans – it means there are still two months until the start of Spring Training for the 2019 season. Thanks to Shout! 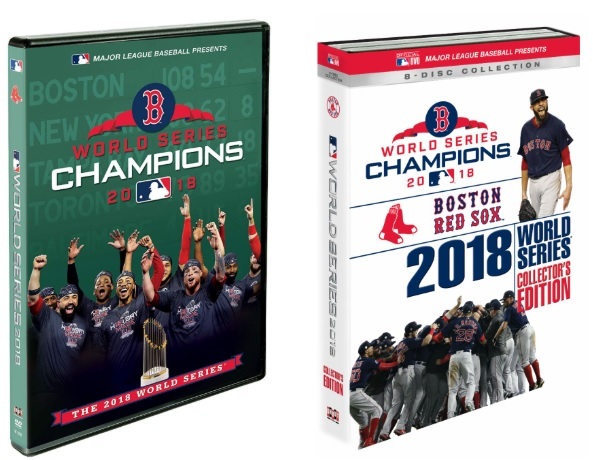 Factory and Major League Baseball Productions, that wait is a little bit easier (for some at least) with their annual World Series releases, The 2018 World Series documentary and 2018 World Series Collector’s Edition: Boston Red Sox. This is an especially positive combination of releases for the most devoted Boston fans, and for baseball aficionados in general. It might be difficult to watch for those who have a very strong dislike of Boston (this critic included), but for others who might not have such a strong dislike, it will be a welcome overall presentation. That is due in no small part to the set’s overall presentation. This will be discussed shortly. The bonus content provided in the sets adds to their presentations. The sets’ overall average price range rounds out their most important elements. Each item noted here is important in its own way to the whole of the collection. All things considered, they make the two presentations collectively yet another home run for the most devoted Boston fans and for baseball aficionados who don’t have a strong dislike of Boston. Shout! Factory and Major League Baseball Productions have had quite the successful run of things in recent years with their partnership. That partnership has seen the release of the Chicago Cubs’ historic World Series win, full presentations of World Series wins by the San Francisco Giants and the historic first win by the Houston Astros, just to name a few. That partnership continued this year with the release early this month with the presentation of the Boston Red Sox 2018 World Series win. The team’s fourth title win in 15 years, the series is presented in full through The 2018 World Series documentary and 2018 World Series Collector’s Edition: Boston Red Sox. That presentation forms the foundation for the sets’ presentation. The Collector’s Edition presents the entire five-game 2018 World Series from its first pitch to its last right from the original broadcasts on FOX. The documentary presentation adds to that presentation by turning the series into a cinematic experience while also highlighting the key moments from the series and presenting commentary from members of the Dodgers and Red Sox. The doc also presents some interesting “non-game” moments for people to enjoy, such as Kirk Gibson taking a pitch from Dennis Eckersley ahead of Game 4, and Dodgers Manager (and former Red Sox player) Dave Roberts sharing memories with members of his former team, including former teammates from the 2004 season. The doc, narrated by award-winning actress Uzo Aduba (Orange is the New Black, My Little Pony: The Movie, The Wiz Live) takes audiences deeper into the series, creating even more appreciation for the set’s overall presentation. Aduba’s narration alone does so much to capture the intensity of the series, especially in that 18-inning Game 3. She puts the emphasis on all of the right moments, pulling in audiences that much more. The whole of that depth and the full experience presented by the Collector’s Edition makes this set’s overall presentation such that it creates a solid foundation for the set. That foundation is strengthened even more through the bonus content presented collectively in each presentation. The bonus content included in the Collector’s Edition is the most important of the bonus material featured in this year’s set. As with past years’ sets, the companion booklet included with the Collector’s Edition is that bonus material. It takes audiences game-by-game, providing specific box scores for each game, as well as gametime temps, game lengths, in terms of time, and even game-specific trivia, such as the revelation that “the 18 combined pitchers used in Game 3 was the most in history for a Postseason game” and that “Cody Bellinger’s sliding catch in Game 2 had only a 14 percent chance of being caught, meaning it was a critical catch. Between this information and everything else presented throughout the course of the booklet, audiences are taken even deeper into each game, than just the presentations on the surface. It makes the experience that much more engaging for audiences, and that much more impressive especially for those noted aficionados who are not defiantly anti-Boston. The addition of the regular and post season highlights in the series’ documentary as bonus content adds yet another layer of engagement and entertainment for audiences. Those highlights include the post season series highlights and even key moments in the regular season that punched the Bosox’ ticket to the post season. There is even a featurette that highlights even more so, how Boston made its way to the postseason. It uses footage of the team’s regular season play to show the road that the team took, leading the league in games won, and the work that went into it all. When one considers the engagement and entertainment offered through that featurette, the value of the box scores and trivia featured in the Collector’s Edition companion booklet and regular season highlights in the doc, one will see that the bonus content featured in this overall set is its own important material. As if the actual content presented across the set is not enough, it once again offers four different audio options. Audiences can take in the game via the Dodgers’ home radio, that of the Red Sox, the actual game telecast from it’s broadcast on FOX and also on Spanish radio. Simply put, audiences are given plenty of options through which they can take in each game. This applies to all five games, adding even more for audiences to appreciate. This is yet another tradition that MLB Productions and Shout! Factory have carried through its past World Series collections, and for which the companies should again be complimented. When this is all considered along with the primary content presented across both presentations, the whole of all of the noted content makes the whole even more engaging and entertaining. The result is a presentation that is well worth the money paid for the sets. The overall average price point of the 2018 World Series documentary and World Series Collector’s Edition: Boston Red Sox barely tops the $80 mark. That price is reached by averaging prices from Walmart, Target, Best Buy, Amazon, Barnes & Noble, Books-A-Million and Shout! Factory. Additionally, it is obtained by collectively averaging the prices for the Collector’s Edition and 2018 World Series documentary from each noted site. Considering that the average price for the Collector’s Edition totals a little more than $60 and the doc alone averages a little more than $20, that total average is actually quite affordable. Add in the breadth and depth of the primary and secondary content featured throughout the two presentations, and that pricing proves even more affordable. It might not be overly inexpensive, but that collective average price for the two presentations also does not break the bank. Keeping this in mind, it makes the two sets together well worth the purchase by and for any Boston devotee and baseball aficionado who does not completely despise the Red Sox. To keep up with the latest sports and entertainment reviews and news, go online to http://www.facebook.com/philspicks and “Like “it. Fans can always keep up with the latest sports and entertainment reviews and news in the Phil’s Picks blog at https://philspicks.wordpress.com. ESPN announced the first slate of games on its Sunday Night Baseball broadcast schedule this week. The network released the 14-game schedule Monday, and this year’s schedule launches March 31 as the Phillies host the Braves in a National League inter-divisional matchup. Week Two will see National League West foes Colorado and Los Angeles go under the lights live. The Dodgers took the division in the 2018 season, and were followed very closely by the Rockies, who trailed L.A. by only one game at the end of the regular season. The Rockies got a wild card slot for the post season, but fell just short of the NLCS, losing 3 games – 0 against Milwaukee. Milwaukee went on to face Los Angeles in the National League Championship series, with Los Angeles winning that series, but ultimately falling in the World Series to Boston. The Braves, who fell to the Dodgers in the NLCS last season, will be on the road against St. Louis in the third game on ESPN’s 2019 SNB broadcast schedule. That game is scheduled for May 26. Boston is also included in this year’s early season broadcast schedule. The Red Sox are scheduled to play live under the lights on SNB on June 2 against their age-old foes, the New York Yankees in New York. This year’s SNB schedule will be preceded by a triple-header schedule March 28 that opens with the Yankees hosting the Orioles in an American League East matchup at 1 p.m. ET. The Dodgers hope to avoid getting snake-bitten as they host the Diamondbacks at 4 p.m. The Mariners host the Red Sox at 7 p.m. to round out the day’s coverage. This year marks the second year that ESPN will be the exclusive home to Major League Baseball’s second-half opener. That game is scheduled to feature the Texas Rangers — in their last year in their current stadium — hosting their cross-state (and AL West) rivals, the Houston Astros. According to a news release from ESPN, broadcast is scheduled to be played at 8 p.m., July 11. This year also marks the first time that it will start its Sunday Night Baseball presented by Taco Bell telecasts at 7 p.m. Baseball Tonight: Sunday Night Countdown presented by Chevrolet will precede the broadcasts at 6 p.m. This season is especially important for ESPN because it marks the network’s 30th year covering Major League Baseball. ESPN’s current SNB boradcast schedule is noted below. *Additional game selections will be determined in the upcoming weeks. Another member of ESPN’s Sunday Night Baseball broadcast team will be back with the group this spring. 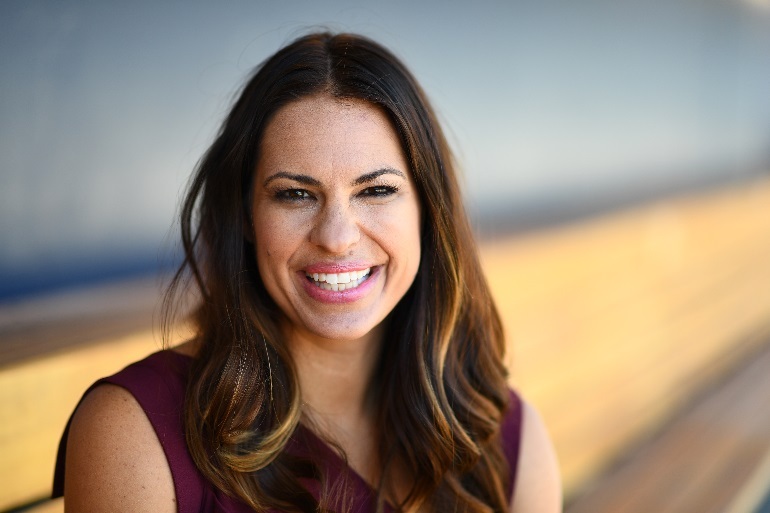 Jessica Mendoza reached a new multi-year contract extension with ESPN this week. 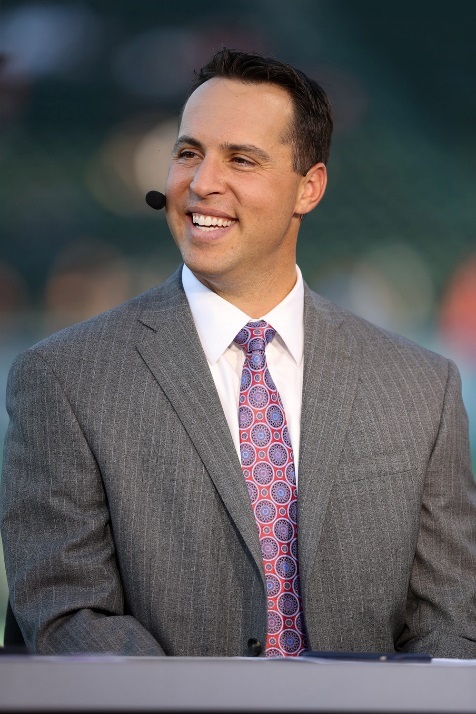 The announcement came only a day after fellow ESPN MLB broadcast team member and MLB vet Mark Teixeira was announced to return. Mendoza said in a news release from the network that she is glad the two sides came to terms on the contract. ESPN Senior Vice President of Production and Remote Events Mark Gross shared Mendoza’s thoughts. Mendoza made history in 2015 when she joined ESPN’s SNB broadcast team. It made her the first woman to ever serve as a national analyst for Major League Baseball games. She also became the first woman to serve as an analyst for an MLB post season game on Oct. 15 when the Yankees and Astros faced off in the American League Wildcard Game live from Yankee Stadium. According to ESPN’s news release, Mendoza is considered “one of America’s greatest softball players.” A graduate of Stanford University, she holds records in categories, such as batting average, hits, runs, home runs stolen bases and slugging percentage. She helped lead the U.S. Softball team to gold in the 2004 Summer Olympics in Athens. She also won a silver medal at the 2008 Summer Olympics in Beijing. Additionally, she will be inducted into the National Softball Hall of Fame next year as a member of the class of 2019. Along with her continued duties on SNB, she will also make appearances on ESPN’s MLB studio program Baseball Tonight, and will make regular appearances on SportsCenter and Get Up! according to the network’s release. To keep up with the latest sports and entertainment news and reviews, go online to http://www.facebook.com/philspicks and “Like “it. Fans can always keep up with the latest sports and entertainment news and reviews in the Phil’s Picks blog at https://philspicks.wordpress.com. Mark Teixeira is sticking with ESPN. The MLB great, who is a three-time American League All-Star and member of the 2009 World Series Champion New York Yankees, has signed a new multi-year agreement with ESPN. The network made the announcement in a news release sent Monday. Teixeira’s new deal ensures that he will remain an analyst on ESPN’s Baseball Tonight: Sunday Night Countdown for the foreseeable future. 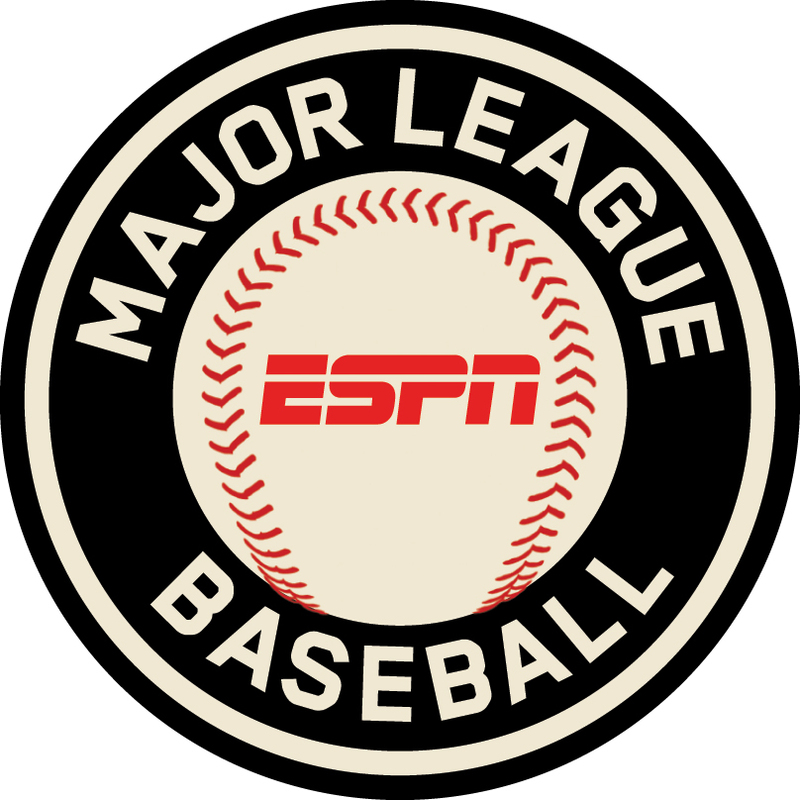 The program precedes ESPN’s Sunday Night Baseball each week throughout Major League Baseball’s season. The contract also ensures he will serve as analyst for other ESPN baseball programs, such as Opening Day, Winter Baseball Meetings and World Series. Teixeira was humble as he talked about his new contract in a recent interview. ESPN Vice President, Production Seth Markman shared Teixeira’s positive thoughts. Along with his work on ESPN’s MLB coverage, Teixeira will also contribute to SportsCenter and will make appearances on ESPN Radio’s programming, including ESPN Radio 98.7’s The Michael Kay Show. Over the course of his Major League Baseball career, Teixeira — a switch-hitting First Baseman — hit 409 home runs, batted in 1,298 runs and won five Golden Gloves. He retired at the end of Major League Baseball’s 2016 season and joined ESPN’s on-air roster at the start of the league’s 2017 season. Boston Red Sox fans got an early Christmas present this year when their team took this season’s Major League Baseball Championship, and next month, fans can re-live the whole series. Major League Baseball Productions and Shout! Factory have partnered once again to release two World Series presentations. The 2018 World Series and 2018 World Series Collector’s Edition: Boston Red Sox are scheduled to be released on Blu-ray on Dec. 4. The 2018 World Series will be presented in a two-disc BLu-ray/DVD combo pack with digital and DVD with Digital. The 2018 World Series Collector’s Edition: Boston Red Sox will be presented on an eight-disc Blu-ray presentation. The 2018 World Series Collector’s Edition: Boston Red Sox will feature all five games of the 2018 World Series Game 5 of the American League Championship Series, in which the team claimed this year’s American League Championship and Game 4 of the American League Divisional Series, which saw the Red Sox defeat the New York Yankees to advance to the ALCS. The exclusive package also features SleeveStats inserts, which include official game stats, trivia and more. Each game in the set features the option to listen to the games’ audio from the team’s own radio network, the opponents’ radio network, Spanish-language broadcasts and television audio. The 2018 World Series documentary is a truncated presentation of this year’s Fall Classic, showcasing the major highlights of the series, as well as the Divisional and Championship series that paved the road to the World Series. It also features bonus content, such as “How They Got There,” regular season highlights and season-clinching moments. To keep up with the latest sports and entertainment news and reviews, go online to http://www.facebook.com/philspicks and “Like’ it. Fans can always keep up with the latest sports and entertainment news and reviews in the Phil’s Picks blog at https://philspicks.wordpress.com.